We were just trying to find other ponies in the area. We need to watch out for each other in these hard times. "We're just trying to find others. 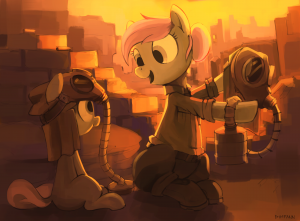 Us ponies should stick together and care to each other during such harsh times, not shooting at each other." you explained politely, not wanting to get a bullet if this stallion get's too offended. >You honestly didn't know what to expect anymore, this is so bizarre. >"Yeah, we mean no harm, miss. We're just walking around and leaving notes in front of houses that may be inhabited." momentarily joined Cushions. >"I see. We are friendly, maybe my grandson makes different impression, but he is a good lad, don't judge him too fast" responded old mare and chuckled a bit. "He just cares about my ancient plot, dat's all." >>"Don't ferget about Salty, granny, she cares too!" interrupted orange pony. >"Of course she does." she assured him softly. "What are yer names, if dey aren't top secret?" "They are not, my name is Spring." >"And mine is Clean Cushions." >"Oho, nice ones, I like dem! My name is Kalina and my lad is Hranchak. You know Salty" said crippled mare, introducing her family to you. "Miss Kalina, do you maybe know about other ponies living nearby, preferably nice ones?" you decided to give it a try. >"We can't leave our home, honey. Hranchak forgot where he dug his holes. It would be stupid. And I can't walk anywhere." >"Could you magic them outside if they wish so, Spring?" you heard your comrade. >>"Oy, I'm not gonna fly like some damn leaf, dem speshal snowflakes can fook demselves wif deir magic!" >"Enouf, no cheesecake. Dat's not how I raised you, sonny!" granny got really pissed off now. "Time of hanging nobles is what should be shame, not pride!" >Would you even consider risking to free them from their home prison with anything, not only magic, or you just want to move on?